These days the question regarding ICT in the classroom is not whether to introduce it but whether to take it to the next level. Tablets and laptops are being used by schools everywhere. Many schools provide these devices – they are returned at the end of class, but there is a growing number of schools using the BYOD (bring your own device) approach. 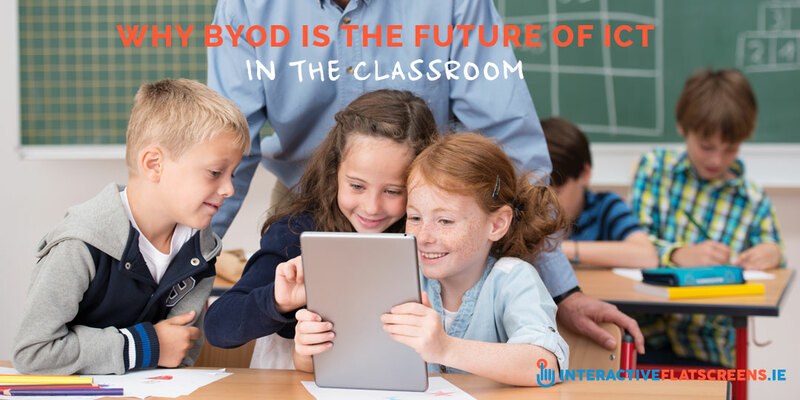 BYOD is the next stage in the evolution of ICT in the classroom. When we consider how education is becoming increasingly learner centred and differentiated, this progression seems natural. Therefore, it is worth our while to look at the advantages of BYOD in the classroom. As the pupil / learner is more familiar with their own device, this speeds up learning and makes for a more satisfying experience. Familiarity brings confidence and confidence is an important factor in a pupil’s performance. Familiarity also means there is less time lost to technical difficulties and learning how to use a device provided by the school. Some things never change and homework will always be a part of education. BYOD allows pupils to continue working on classroom lessons at home. BYOD is about bringing some of your home into the classroom but also bringing some of the classroom into home. It doesn’t take a genius to see that education is becoming increasingly learner centred. BYOD supports this revolution in the classroom. By using their own device, pupils can learn at their own pace. BYOD fosters a sense of independence and self-sufficiency among learners which is good preparation for both third level education and the work place. Self-esteem. Because they are using their own devices, pupils have more power at their fingertips which raises self-esteem. They know more about their own device more than anyone else and with this knowledge comes ease and confidence. BYOD contributes to class discipline as there is less boredom and frustration, feelings which can often lead to unruly behaviour. Each pupil can work away at their own pace. In a sense, they are taking on the responsibility for their own learning and they will reward the teacher with good behaviour for having the confidence in them to allow this. Of course, there are challenges involved in the BYOD approach. Not least is potential negative behaviour towards those from lower socio-economic backgrounds who might not have the latest, expensive technology. 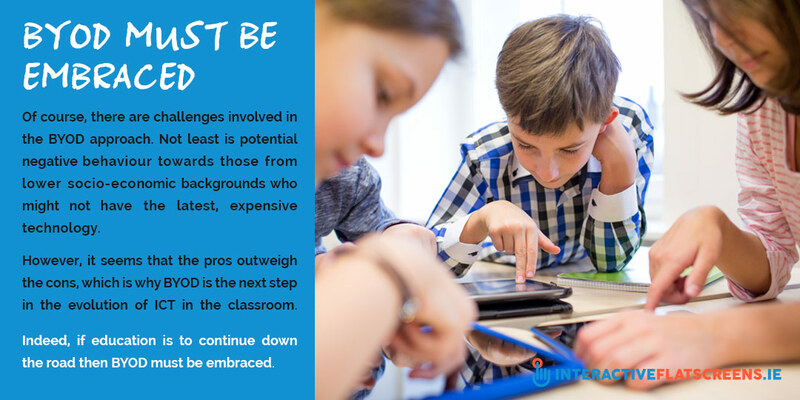 However, it seems that the pros outweigh the cons, which is why BYOD is the next step in the evolution of ICT in the classroom. Indeed, if education is to continue down the road then BYOD must be embraced. If you’d like some help or info in how to kit out your classroom with the latest in interactive flatscreen technology and the best devices for classroom use then give us a call now on +353 1 466 0515 or contact us online!